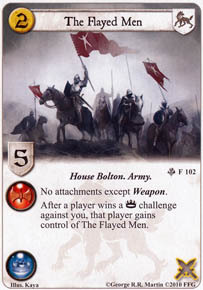 After a player wins a Power challenge against you, that player gains control of The Flayed Men. If i declare a power challenge with this card and i loose,will it still be knelt when it changes control? If I lose this card after a failed power challenge, and then at some point after the opponent loses a power challenge to me. Do I get it back? Yep. The "you" in the text box refers to the card's (current) controller, not the owner.